For Cyber Monday we have deep discounts on a few items. We're happy to offer this to our newsletter readers. 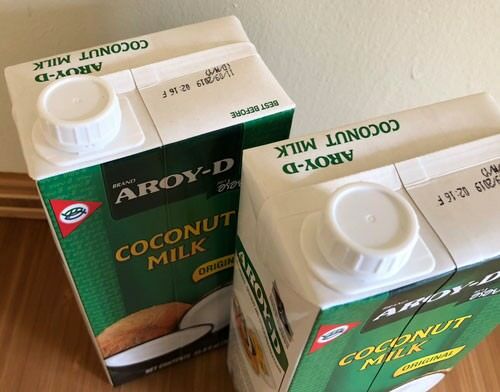 Aroy-d has a new easy-open (and close) top for all natural coconut milk in 33.8 oz boxes. We have lots of this available, and are offering deep discounts on Cyber Monday. Reg price $165 (MSRP in Japan $175). This knife is made entirely by hand at a master craftsman's shop in Sakai, the area best known for making the finest knives of Japan. Read the review we received on this knife. An extremely well-made knife that we buy directly from the small shop Japan where it's made. For Cyber Monday we're offering this at our cost, which way below what you'd pay in Japan where most knives like this have a 50%+ markup at the retail level. Ships in a nice Gift Box, as shown at link. Won't last long. Another one of our Hand Forged knives made entirely by hand by a gentleman in Sakai Japan. This is the 'Nakiri' style which is used for vegetables and various purposes. The blade has 'black finishing' as you can see the steel is worked a special way to give it a natural black look, on the upper 3/4 of the blade. Reg $18.50 per set. Handpainted ceramic dinner plates imported from Thailand. Each piece is painted by hand using a traditional design unique to Thai artisans. You will appreciate the weight of this thick, ultra-high quality plate. Reg $18.25 per set. Each piece is painted by hand using the same traditional design as our plates. This is not offered at any discount for Cyber Monday but we thought we'd include it here because we like it so much. 'Namprik Thai Tae' means Real Thai Namprik. A combination of salty and spicy, from dried shrimp and crushed chilli peppers. Can put it on anything and it's a great unique fresh gift for anyone who likes Thai food. This premium namprik is hard to find in Thailand and people buy it from us to take back home. This took some extra effort at our side to import and it's also kind of expensive due to the shrimp. We're proud to offer this! Product of Thailand.